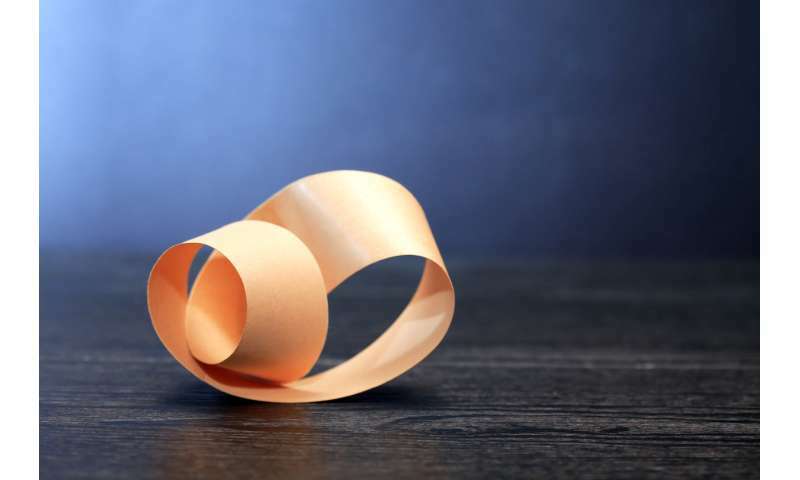 A Möbius strip can be created by taking a strip of paper, giving it an odd number of half-twists, then taping the ends back together to form a loop. If you take a pencil and draw a line along the center of the strip, you'll see that the line apparently runs along both sides of the loop. The concept of a one-sided object inspired artists like Dutch graphic designer M.C. Escher, whose woodcut "Möbius Strip II" shows red ants crawling one after another along a Möbius strip. An animation of ants crawling along a Möbius strip, inspired by M.C. Escher’s artwork. The Möbius strip has more than just one surprising property. For instance, try taking a pair of scissors and cutting the strip in half along the line you just drew. You may be astonished to find that you are left not with two smaller one-sided Möbius strips, but instead with one long two-sided loop. If you don't have a piece of paper on hand, Escher's woodcut "Möbius Strip I" shows what happens when a Möbius strip is cut along its center line. While the strip certainly has visual appeal, its greatest impact has been in mathematics, where it helped to spur on the development of an entire field called topology. A topologist studies properties of objects that are preserved when moved, bent, stretched or twisted, without cutting or gluing parts together. For example, a tangled pair of earbuds is in a topological sense the same as an untangled pair of earbuds, because changing one into the other requires only moving, bending and twisting. No cutting or gluing is required to transform between them. Another pair of objects that are topologically the same are a coffee cup and a doughnut. Because both objects have just one hole, one can be deformed into the other through just stretching and bending. The number of holes in an object is a property which can be changed only through cutting or gluing. This property – called the "genus" of an object – allows us to say that a pair of earbuds and a doughnut are topologically different, since a doughnut has one hole, whereas a pair of earbuds has no holes. Unfortunately, a Möbius strip and a two-sided loop, like a typical silicone awareness wristband, both seem to have one hole, so this property is insufficient to tell them apart – at least from a topologist's point of view. Instead, the property that distinguishes a Möbius strip from a two-sided loop is called orientability. Like its number of holes, an object's orientability can only be changed through cutting or gluing. Imagine writing yourself a note on a see-through surface, then taking a walk around on that surface. The surface is orientable if, when you come back from your walk, you can always read the note. On a nonorientable surface, you may come back from your walk only to find that the words you wrote have apparently turned into their mirror image and can be read only from right to left. On the two-sided loop, the note will always read from left to right, no matter where your journey took you. When the GIF starts, the dots listed off clockwise are black, blue and red. However, we can move the three-dot configuration around the Möbius strip such that the figure is in the same location, but the colors of the dots listed off clockwise are now red, blue and black. Somehow, the configuration has morphed into its own mirror image, but all we’ve done is move it around on the surface. This transformation is impossible on an orientable surface like the two-sided loop. Credit: David Gunderman. Since the Möbius strip is nonorientable, whereas the two-sided loop is orientable, that means that the Möbius strip and the two-sided loop are topologically different. The concept of orientability has important implications. Take enantiomers. These chemical compounds have the same chemical structures except for one key difference: They are mirror images of one another. For example, the chemical L-methamphetamine is an ingredient in Vicks Vapor Inhalers. Its mirror image, D-methamphetamine, is a Class A illegal drug. If we lived in a nonorientable world, these chemicals would be indistinguishable. August Möbius's discovery opened up new ways to study the natural world. The study of topology continues to produce stunning results. For example, last year, topology led scientists to discover strange new states of matter. This year's Fields Medal, the highest honor in mathematics, was awarded to Akshay Venkatesh, a mathematician who helped integrate topology with other fields such as number theory. In a mobius strip the observer sees a hole but a hole must be enclosed by an edge. The mobius edge only partly encloses the hole as it transitions to the outside of the strip. The strip surface does not enclose the hole either. Cutting the strip creates one loop, cutting it twice creates two interconnected loops. Cutting off center creates other objects. If you take a 1 dimensional line and connect the ends, do you not get a hole? There is the centerline which does not twist around, and forms such a circle. No you get a loop. So ask yourself would a moebius loop be a hole in something, and if so, what? A loop has a hole, or am I craaazzzzy? The shared portion of wall inside the ring would be a mobius strip. No you get a loop. A closed loop is an edge that circumscribes a hole. So ask yourself would a moebius loop be a hole in something, and if so, what? Take a circle on a two dimensional surface. That's a hole. Now twist the surface along the third dimension so the loop forms a figure 8. Then fold the surface in on itself so the two halves of the 8 overlap. The loop is still a hole through this folded surface. A hole to me is a hole IN something. Not the void circumscribed by a loop. But I've learned that a topological hole is the thing in an object that keeps it from shrinking to zero. But no the hole is not the loop which circumscribes it. Ie not through the folded surface. The surface of the loop itself has no hole. This is apparently one of those things that has already been discussed as infinitum, with differing conclusions. Which demonstrates how futile it is to use words to describe math and physics concepts. Also, eikka, a closed loop can encompass a solid such as a pie crust. It need not be a void.